Work has been insane recently so I’ve not had very much time to update the blog in the past week, but I did take a picture for Bag ‘n’ Shoes – I just neglected to upload it, cos I’m like that. My idea was to update these on a Wedneday, to celebrate hump day, so if I stay on track there should be another post like this the day after tomorrow… And, happily enough, my next Bag ‘n’ Shoes day after that falls on my birthday! And I happen to know I shall be receiving a rather splendid new bag then, because I bought it! Anyway, shall I shut up and get on with it? I was definitely feeling the love for autumn last week – there’s nothing quite like the crisp air and the sunshine through the red and brown leaves. It’s probably my favourite season! So as soon as it gets slightly chilly I’m in my wardrobe, cackling with glee, airing out my jumpers and scarves and getting ready for the cold. It’s not *quite* cold yet – in fact, today, it’s bordering on warm – but I’m going to get excited anyway. I wore my new-to-me red and green tartan scarf from Abercrombie and Fitch, which you can just see in the picture. A bargain on eBay and such a great colour! And, you can also see my big sloppy jumper from hush in there too. But that’s not the main attraction! My lovely brown leather Antonia bag from Hobbs is surely the star of the show! I got her with my voucher I won from Ascot the year before last, and these Camden flats from Accessorize were bought on a recent trip to London when my feet just gave in in my heels – they were on sale, and I love the colour and the studs. 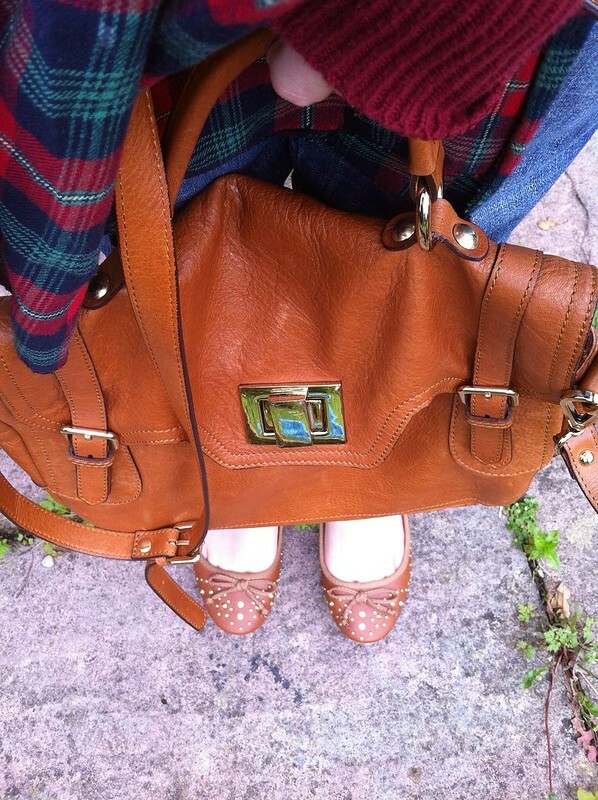 (You can buy shoes from Accessorize here: I love their range!) So far my combos have been very matchy matchy, but unfortunately I think that’s going to be a theme for me! Maybe this little feature will encourage me to be more daring with my combos.